It’s not an unknown fact that Apple’s iOS App approval process isn’t, well, the best, and sometimes stuff tends to ‘slip through’. FlashArmyKnife is a brilliant example of this which enables tethering a cellular connection on a non-jailbroken device. You’ll want to grab this one quickly though, as Apple will most likely pull this pretty quickly. 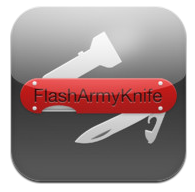 The innocently titled FlashArmyKnife combines seven little utilities into one iPhone app: flashlight with adjustable brightness, built-in web browser with bookmarks, fully functional trigonometry calculator, satellite view map, currency converter, compass and battery indicator. As useful as these are, you’ll want FlashArmyKnife for its hidden tethering feature, enabling the cellular connection to be broadcast and used to a WiFi compatible device for sharing the connection. Have you ever taken your dog outside at night and used your iPhone as a flashlight for it to see? Have you ever used your iPhone flashlight to light up someone repairing a flat tire? How many other situations have you stood there looking at a simple Flashlight app with nothing else to do while you hold a light for someone? Well here comes FlashArmyKnife. 7 Apps in 1, you can surf, map, convert, calculate, check battery, all in one app! All in one! No ads, and it looks decent too! To enable tethering, run the app and hit the Calculator tab at the bottom. 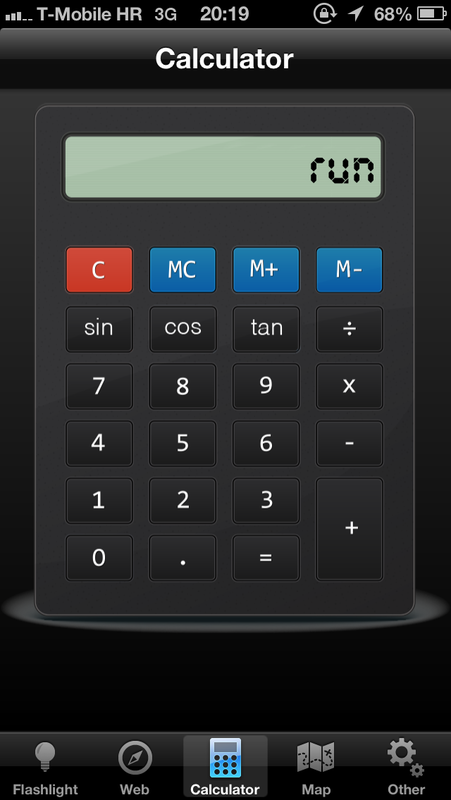 If you entered the combination correctly, the calculator display should read “run”, as shown below. Tethering is now enabled (HTTP port: 6667, SOCKS port: 6668). To stop tethering, just tap the “C” button on the calculator. The app’s optimized for the iPhone 5 and supports the iPhone 3GS/4/4S, third-gen iPod touch or later and iPads running iOS 5.1 or later. It’s the perfect way to share your brand new iPhone 5’s connection with that new iPad Mini you got for Christmas, without a dedicated tethering plan. As mentioned, this type of App breaches the App Stores regulations so it will be of no surprise when the App gets pulled, and it is expected that will be promptly. As mentioned, this is supported without requiring a jailbreak, so simply click this link, download it, and enjoy.